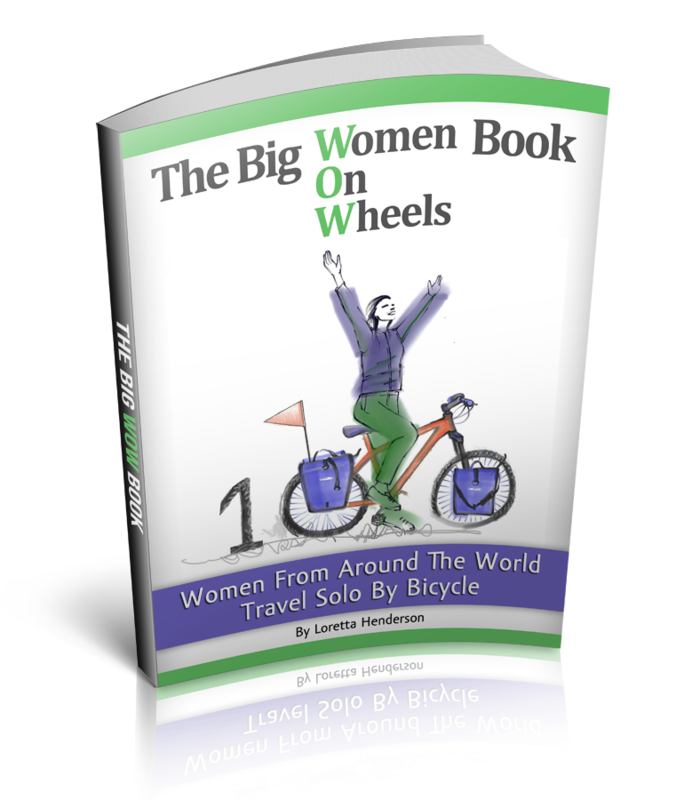 Over the next 6 months, as I continue to round the world by bicycle, I am presently pedaling from Cambodia, Asia to Africa via Laos, China, Kazakhstan, and Russia crossing the Black Sea and pedaling through Turkey and then catching a boat into Africa. The dream is not about cycling there, for after 21 months of pedaling, 14 countries and a whole lot a bicycle miles already, Pandemic The Magic Bicycle and my legs have proven to be such trusty steeds that with a little hope and faith, I will arrive by magic bicycle in Africa sometime in the early summer. However, as the embryo of the dream develops in the near future into a fetus, the developing dream will span across 3 continents and 7 countries. The dream? It is to raise awareness and funds for bicycle ambulances in rural Africa throughout my 6,000 mile pedaling voyage to get there. A what? That’s right, a bicycle ambulance. 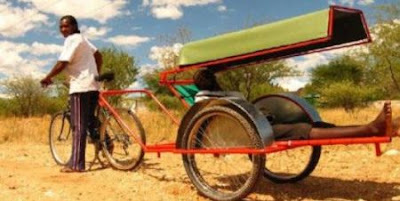 In rural Africa, the people are so inventive and spirited, that a bicycle is truly saving lives. 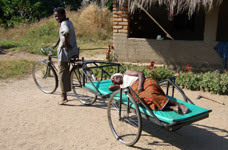 In countries throughout sub-Sahara Africa, bicycles with attached stretchers are being used to transport birthing mothers and the sick to the nearest hospital. In rural Malawi, often the closest hospital is 30 kilometers (about 20 miles) away. The surrounding villages lack funds for vehicles and without adequate medical resources women and babies are dying in childbirth at alarming rates. 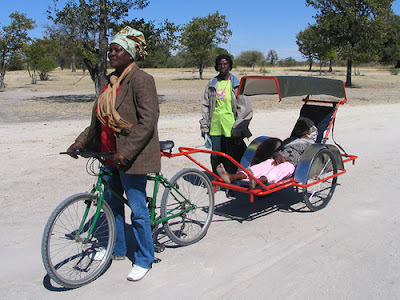 With the UN pledge of reducing child mortality rates by ½ this century the rural villages of Namibia, Malawi, South Africa, Uganda are in need of bicycle ambulances to safely transport birthing mothers and the sick to nearby hospitals. A bicycle ambulance costs about $500USD, they are being built locally, a facility in Namibia has already provided 55 to Namibian villages, in those regions the woman and child mortality rates have been drastically reduced. In most of sub-Sahara Africa, there is a severe shortage of doctors and proper medical facilities. Often a woman in the village serves as a midwife, babies are frequently delivered in a hut on a dirt floor without medical supplies, a mere 30 miles from the hospital. Adequate transportation to the hospital is often needed due to infection and other complications. The 20-30 miles of terrain between village and hospital is dirt track roads; it is perfect terrain for the bicycle ambulance. And African legs are proving to be perfect for the job. · Tell Oprah, just kidding…but hey dare to dream right? A huge thank you to everyone who have already purchased a Be The Adventure t-shirt and donated towards a bicycle ambulance, for a list of featured fans visit www.skalatitude.com. A special thanks to my ultra supportive Dad for shipping them out of his basement for me while I am out pedaling to Africa.